Jimmy Smits Shows Dark Side On "Dexter"
Jimmy Smits' work on "L.A. Law," "NYPD Blue" and "The West Wing" made him a household name. He is back on TV, this time on Showtime playing assistant district attorney Miguel Prado on the hit series "Dexter." The juicy role is unlike anything else he has done before. "I had to get that South Florida guy out of my system some way, so they were kind enough to kind of let me do that over there. He is just somebody who is very principled in the way he thinks about what the law means to him and it justifies it in his own way," Smits told Early Show co anchor Maggie Rodriguez. In some ways, Smits' character justifies his actions, thus having the same tendencies that Dexter, the serial killer has. "But Dexter lives by a very strict code and I think Miguel is a little bit more askew in terms of that," Smits said. Smits' character is a bad guy this time around. "They kind of promised that it would have a lot of different colors and shapes in terms of the way he goes, but he's gregarious in a lot of ways. Now it's starting to take a little bit of a turn," he said. "I'm happy working with Michael C. Hall and that whole cast. Great writing on the show." Rodriguez took Smits down memory lane to when she played a reporter 12 years ago on "NYPD Blue" and The Early Show dug up the clip. "You don't even recognize me! That's horrible!" she said. "Do you know what is great about that? My three favorite people. That's one, my partner in life, Wanda de Jesus and Dennis Franz and Maggie Rodriguez, my three favorite people in the world in the same frame," Smits gushed. 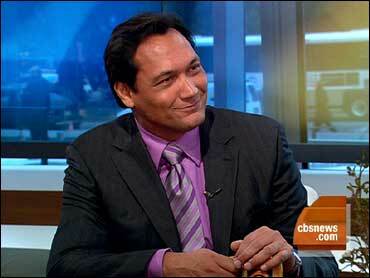 CBS national correspondent Jeff Glor brought up Smits character Matt Santos on "The West Wing," to Rodriguez. Rodriguez wondered if Smits' character was based loosely on Barack Obama. "That's been coming out in the last year because in England, they were just getting the show, so while the election cycle was happening, they were talking about that." Smits explained. "They -- the writers on the show were talking to Axelrod in the beginning when they were kind of setting the template of what the character would be and that young state senator from Illinois." "Who became the first minority president of the United States," Rodriguez said. "I think in a way what they wanted to do with the character is open the possibility in some people's minds that something like that is possible," he said. "Maybe a Latino next?" Rodriguez added. "There are people out there that are ready," he said.